Your Message in the Bottle. It Takes a Network! The magazine you’re holding in your hands is a special edition that celebrates our first five years, with a selection of the best of our articles, interviews, and reporting. The pieces you see here, are almost all print versions of our television stories shown on our “i-Italy TV” program, now also five years old, which airs every Sunday on NYC Life. And our web portal, i-Italy.org, turns 10 in May. In my first editorial I wrote that this was “a magazine with a heart.” And this is indeed the spirit with which we are still stubbornly around today. But why didn’t we just stay online? Still, because of the heart, I guess. We were born online: the Internet is our home. But because keeping physical contact with the people and the world around us remains fundamental.,our challenge has been integrating different media, online and offline. Our Italy is everywhere, and speaks to everyone. You can find it on the web and on social networks, every day. wherever you are, in your in-box every Friday. If you live in the New York City area, you can sit on your sofa and watch us on TV, every Sunday at 1pm. 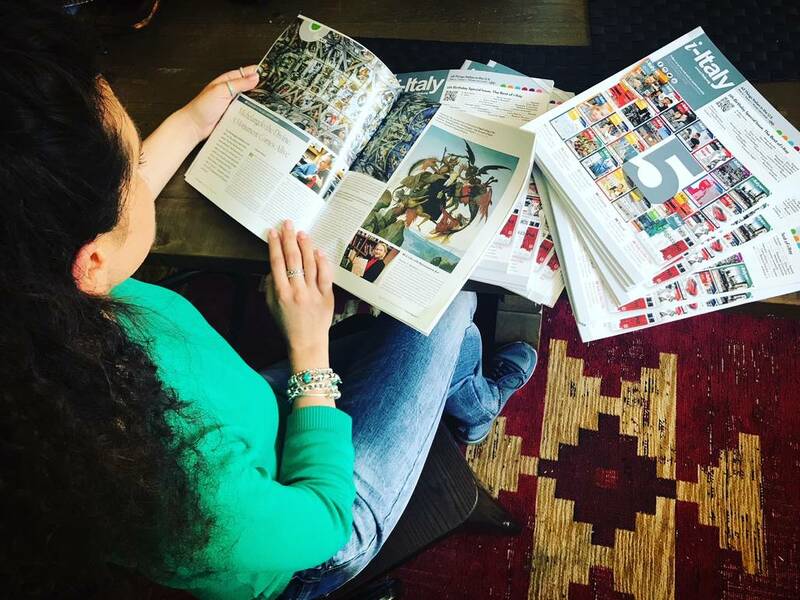 And look for us, on glossy paper, every two months for more in-depth, relaxed reading—you can find us in New York , Boston, Washington, DC, Los Angeles, San Francisco, and soon in Miami and Chicago. But today we face the typical birthday question: What will we do when we grow up? We don’t have the answer yet, but we do know that the biggest challenge so far lies in front of us. And that we cannot meet it by ourselves alone. The time has come to rally all those who truly believe in the importance of communicating Italicity in this country with a message that goes beyond the existence and experience of i-Italy. The real challenge we face is to reshape an editorial landscape that, despite ours and others’ efforts, has yet to yield its full potential. Why, we wonder, having in our hands a powerful tool like “Brand Italy,” so little is done, and so poorly, even today, even in America? Why isn’t there yet a major “Italic” television network in America? An “Italian_Food + Travel + Lifestyle_Channel” to tell us everyday in English (please!) about the thousands of stories and people, places and recipes, cultural events and quality products that are in fact the Italian experience in this country? And why don’t we have a national magazine that does the same, in synergy with other media? And finally a digital platform (or a “federation of digital platforms”) to connect all of this to social networks? This is our model. We conceived it, and we started it. But realizing its rich potential nationwide takes many more resources. Where are these resources to be found? Is a consumer public missing? I don’t think so. In the US there is a “market niche” of at least 50 million people who love Italy for emotional, family, professional, or cultural reasons—or just for pleasure. Almost 20 million of them have Italian roots; they may no longer speak the language, but they have Italy in their hearts. Then there are the millions of food and wine lovers who fill Italian restaurants and pizzerias coast to coast; those who adore Italian fashion and design; and those who appreciate Italian art, cinema, literature and music. The audience is there. It can be done! And the resources essential for reaching this audience are also there. On the Italian-American side, there are influential associations and foundations with thousands of members including entrepreneurs, managers, professionals, artists, and celebrities. On the Italian side there are special institutions for the promotion of culture, commerce, and tourism, and they’re often very active. As for the business world, there are thousands of Italian and Italian-American companies, small and large, many of them very successful. And many others are poised to connect to this market. The resources are there. And they can be tapped. So why so little and so poorly is done in this field? The usual answer is that Italians share no common vision of how things get done. They do not work as a team, and individualism is an old, persistent part of the Italian character, which doesn’t know how to collaborate. Italian individualism is a great wellspring for creativity, but also a big barrier to competitiveness and success in today’s global world! This kind of fragmentation affects both the world of Italian-American associations and Italian companies abroad. And it affects the media, too. All of us in the profession of communication—Italians, Italian-Americans, and American “italophiles” with a passion for journalism and the mission of “Italian storytelling”—are scattered in dozens of little corners: websites, blogs, Facebook pages and, locally, a few newspapers and a handful of television programs. Some are media of excellent quality with a significant following. But we haven’t even tried to unite and collaborate to a larger, national-level information and communication network capable of making connections—to the public, and to the marketplace. And to those looking to invest but without ways to effectively reach the vast “Italic niche” in the US. Why not try? Our experience shows there is room to grow, but we must do it together if we want to make a difference. We are ready to go beyond i-Italy with those who want to join us in building a culturally and economically sustainable project. If we do that, in five years we’ll be discovering America (one more time). Il nostro messaggio nella bottiglia. Facciamo rete! Tra la mani avete un’edizione speciale per festeggiare i primi cinque anni di i-Italy Magazine, con una selezione dei nostri migliori servizi, le interviste, i reportage pubblicati. Inoltre, quasi tutti sono il racconto cartaceo di servizi televisivi. Compie infatti 5 anni anche il nostro programma “i-ItalyTV” in onda ogni domenica alle 13 su NYC Life. Il portale web i-Italy.org, invece, ne farà 10 tra qualche mese, essendo stato varato nel maggio 2008! Su Internet ci siamo nati, è casa nostra. Ma il contatto fisico con il territorio e con la gente rimane fondamentale, e integrare media diversi è stata la nostra sfida: un’Italia per tutti, dappertutto. Online e sui social ogni giorno ovunque sei; nella tua in-box il venerdì; nella TV davanti al tuo divano, la domenica. E in carta ogni due mesi per una lettura più approfondita, rilassata; e non più solo a New York, ma anche a Boston, Washington, Los Angeles, San Francisco, e presto a Miami e Chicago. Ma oggi, giunti dove siamo, c’è la domanda che si fa nel giorno del compleanno: cosa faremo da grandi? La risposta non l’abbiamo, ma sappiamo che la vera sfida ci sta difronte. E che non possiamo vincerla fino in fondo da soli. E’ venuto il momento di lanciare un messaggio a chi crede davvero nell’importanza di comunicare l’italianità fuori dall’Italia. Un messaggio che va al di là dell’esistenza e dell’esperienza di i-Italy. La vera sfida che abbiamo davanti è quella della comunicazione professionale dell’Italia negli USA. Dare una scossa ad un panorama editoriale che, nonostante gli sforzi nostri e di altri, rimane deludente. Perchè, ci chiediamo, avendo in mano un gioiello come il “Brand Italia” si fa così poco e così male, ancora oggi, perfino in America? Perchè non c’è ancora un vero grande network televisivo “italico” in America? Un “Italian_Food+Travel+Lifestyle_Channel” che racconti ogni giorno—ma in inglese, per carità!—le migliaia di storie e di persone, di luoghi e di ricette, di eventi culturali e di prodotti di qualità che fanno l’esperienza italiana in questo paese? E perchè non c’è un magazine a distribuzione nazionale che faccia lo stesso, magari in sinergia con il video? E poi una piattaforma digitale (o una “federazione di piattaforme digitali”) che rimandi tutto questo online, sui social? E’ vero, questo è il modello i-Itay. Ma per realizzarlo davvero su scala nazionale negli USA, ci vuole qualcosa di molto più grande. Perchè non c’è? Manca il pubblico? Non credo proprio. Negli USA c’è una “nicchia di mercato” di almeno 50 milioni di persone che per motivi affettivi, genetici, professionali, culturali o semplicemente di gusto, amano l’Italia. Quasi 20 milioni di loro hanno un’origine italiana; non parlano più la lingua, ma hanno l’Italia nel cuore. Poi ci sono i milioni di americani che riempiono i ristoranti e le pizzerie italiane; quelli che adorano il gourmet, la moda e il design italiani; e poi gli amanti dell’arte e del cinema, della letteratura e della musica. Il pubblico c’è, si può fare. Mancano le risorse? Mi sembra difficile. Sul lato italo-americano, ci sono influenti associazioni e fondazioni con migliaia di aderenti tra cui imprenditori, managers, professionisti, artisti e celebrities. Sul lato italiano ci sono apposite istituzioni di promozione culturale e commerciale, spesso attivissime. Quanto al mondo economico, ci sono migliaia di aziende italiane e italo-americane, piccole e grandi, molte delle quali di alto prestigio. E tante altre sono pronte a sbarcare su questo mercato. Le risorse ci sono, si può fare. E allora perchè si fa ancora tanto poco e tanto male sul piano della comunicazione? La risposta più diffusa è che manca una visione comune. Gli italiani non fanno squadra quasi mai. La frammentazione è una costante del carattere italiano, che non sa (e spesso non vuole) collaborare. L’individualismo italiano—grande ricchezza di creatività, ma grande limite all’affermazione competitiva nel mondo globale di oggi! Questo è certamente vero e si applica a tutti, dal mondo dell’associazionismo italo-americano a quello delle imprese italiane all’estero. Ma mentre lancio questo messaggio nella bottiglia che invita a fare squadra, voglio anche fare un mea culpa come operatore della comunicazione. Noi professionisti della comunicazione, italiani, italo-americani, e americani “italofili”, con la passione per il giornalismo e la missione del “raccontare italiano” ci siamo sparpagliati in decine di piccole esperienze: siti web, blog, pagine facebook e, localmente, qualche giornale in carta e qualche programma televisivo. Alcune di queste esperienza sono di ottima qualità e hanno un seguito non indifferente. Ma non abbiamo saputo unirci in un network, creare una rete capace di proporsi innanzitutto al pubblico, e poi al mercato: a chi ha risorse da investire, ma non ha un mezzo di comunicazione adeguato a raggiungere efficacemente la vastissima “nicchia Italica” negli USA. Vogliamo provarci insieme? La nostra esperienza dimostra che è possibile crescere, ma dobbiamo farlo insieme se vogliamo fare la differenza. Noi siamo pronti ad andare oltre i-Italy con chi vorrà unirsi a noi in un progetto comune culturalmente valido ed economicamente sostenibile.